A true trip down memory lane. What is it about the archetype of the transforming robot that caused it to be so engraved on an entire generation of young boys? 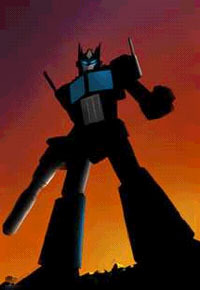 Sure, He-Man and GI Joe are cool, but nothing can compare to the coolness of Optimus Prime- NOTHING. Transformers The Movie, a flop when it was first released, has achieved semi-religious status among thousands of Transformers geeks in the years since it's release, and the toys have replaced Star Wars figures as THE cool 80's toys to collect. For those of you who have been Transformers fans since the days of the die-cast Takara figures who want to recapture that magic, or for anyone who's looking for a crash course in Transformers 101, Antarctic Press has created the ultimate guide: the Cybertronian. What exactly is the Cybertronian? Well, it's a TV/comic/movie reference guide, crossed with a toy price guide, only without the prices. As Harold Tietjens, one of the two editors, describes it: "It's a way for people who are rediscovering their Transformer collections to find out which pieces go with which character, and to find out all the information on the packages that they threw away long ago". Two volumes have been released so far. The first volume covers everything released prior to the movie- Generation 1, series 1 and 2. Book 2 covers all of the toys from the movie, and the toys and episodes that followed. The upcoming book 3 (due out this fall) will cover series 4 and all of those crazy headmasters and other crazy stuff that came out after I'd "grown out of Transformers". The bulk of each 100 page volume dedicates anywhere from ½ page to 2 full pages to each and every Transformer toy of the era, including multiple photographs, stats, quotes, bios, and accessory lists. The descriptions are quite thorough, and highlight which characters are re-paints, which have variants, and what kind of vehicle each is supposed to represent. There's even some trivia notes about prototype and Japanese-only figures. The back of each book features an episode guide to the TV show and comics.. The first book covers episodes 1-29, while book 2 covers episodes 30-52 and the movie. A full 8 pages are dedicated to the movie, including voice cast photos, and just about all of the memorabilia from the US and Japan. The Cybertronian is a labor of love by Harold Tietjens and Doug Dlin, and it shows (Mr. Tietjens photographed his own collection of toys and comics for the books). While these books could have been modeled as price guides, with flashier pictures and more catalogue-like listings, they instead treated the characters with as much dignity as $9.99 chunks of plastic could hope for. The production design isn't perfect- the colors are a bit washed out, and the cover of book 2, featuring a close-up of Optimus Prime's leg, could have been more exciting, but overall it's a nice looking series of books. Because of the smaller print run, the price tag is a little high for the number of pages ($25 for 96 pages), but for anyone who ever loved a transforming big rig, it's worth every penny. NOTE: The author is embarrassed to admit that when he was 7, he wished (in a serious wishing way that only kids can wish) for all of his Star Wars toys to turn into Transformers toys.